Det er en spennende sak som Ping nå kommer med. Se opp for Apple Watch og Ping. Det er mye nytt man kan skaffe seg for å kunne spille bedre golf og ha mer glede av sitt spill på banen og under trening. Her får du flere saker innebygd samtidig. PHOENIX (November 16, 2015) - Today PING launched a new app that includes the Golf Workout, an Apple Watch feature engineered to capture and track fitness data, swing tempo and on-course statistics. The PING app also houses updates to iPING, a putting-improvement tool that attaches to a putter shaft using an iPING Cradle, and works in conjunction with iPhone. In addition, there’s a new PING trivia game created to share the brand’s rich heritage and its focus on innovations that help golfers play their best. The iPING app is a free download from the App Store, with the full Golf Workout experience available as an in-app purchase. 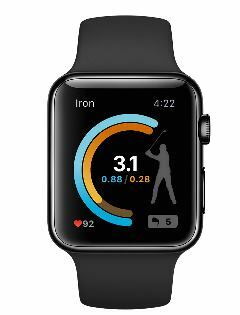 According to Solheim, PING’s in-house app development team focused on bringing more visibility to golf’s health benefits by using key exercise metrics gathered from Apple Watch. Golf Workout records heart rate, step count and calories burned in either the Swing Practice or Play Golf modes. In the Swing Practice mode, golfers can also time their backswing and downswing, providing a measure of tempo to help hone their swings for improved results on the course. The Play Golf function allows the stat-focused golfer to track important data, including fairways hit, greens in regulation, and putts per round. You can also keep score using the PING app on Apple Watch. The iPING feature has been updated with a new graphic interface and provides golfers two options that lead to improved putting. In Practice mode, golfers can focus on improving key attributes of their putting stroke, including tempo. The Putting Handicap function analyses a series of five putts to determine a consistency score, which equates to a handicap patterned after the traditional handicap system (lower is better). Each five-putt session is stored for comparison as golfers challenge themselves to lower their Putting Handicap (PHcp). PING is offering new iPING cradles to fit the iPhone 6/iPhone 6s and iPhone6 Plus/iPhone 6s Plus. Users can also learn the story of the PING brand through a trivia game that tests their knowledge of the company’s rich history, tour staff and product technologies.